Vin Diesel — the less attractive dude in the Fast & Furious movies — has 46 million Facebook likes. The actor joined Facebook in April 2009, a time when only one person had over a million likes (President Barack Obama). His page quickly skyrocketed to #1 — passing major corporations like Coca-Cola who were undoubtedly spending truckloads of cash on social media. 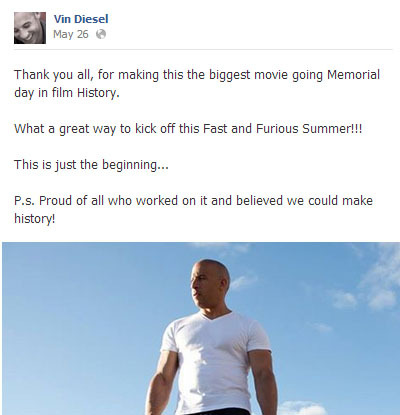 Facebook was so confounded by this (Vin Diesel? Seriously?) they called him up to their offices demanding to know what in the [bleep] he was doing. Well, Vin didn’t return our requests for a Duolit exclusive interview (I think he’s probably at work on Fast & Furious 47: Go Kart Kingdom), but just like we broke down the product launching genius of Justin Timberlake and marketing savvy of Will Smith, we decided to bring you the Vin Diesel School of Facebook. Grab your pencils and highlighters kids, this is going to make a world of difference for your Facebook account. This is the #1 most important thing for any social media outlet: Be yourself. 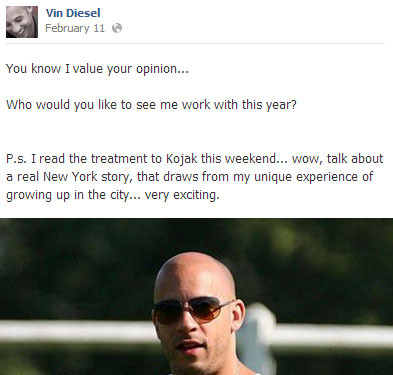 What Vin Does: Vin writes all his posts himself — not via a paid PR person — because that’s the only way his fans can get to know his personality. That means he shares some personal details about his life along with updates about his latest film projects. What You Should Do: Don’t stress over every word of your post. Facebook is not about achieving the perfectly crafted post — it’s about showcasing all the things that make you who you are. What influences you? What inspires you? What makes you laugh? Share these thoughts with your fans and you’ll probably find out they are moved by the same things! To keep your fans interested and entertained, you need to think outside the box. Look, Vin’s not going to be tearing it up on American Idol anytime soon, but by going outside of his comfort zone and creating something his fans would never have expected, he broke up the normal chain of posts and entertained his fans with something really fun. What You Should Do: Research other popular fan pages to find exciting and different ideas for posts your fans will love. Go outside the realm of books and think of what else you could share (via video or any other medium) that would achieve #1 while also creating something really unique for your readers. Post a video or picture of yourself dressed as your favorite TV character, share a clip from your favorite movie, or post the link to a fun BuzzFeed quiz your readers would be interested in. If you’re not getting responses from your fans, you’re probably giving a speech instead of carrying on a conversation. What You Should Do: You will always (ALWAYS) get more responses (comments/likes) from fans with a post that ends in a question mark instead of a period. You can pose basic questions (What are you up to today? What exciting plans do you have for the weekend?) or you can go deeper and ask fans for their input in your books. Your readers will feel more a part of the story that way — plus you might get some great ideas! Posts with pictures or videos are always more popular than plain ol’ statuses. What Vin Does: Every single post Vin shares has a photo or video attached. Every. Single. One. Visuals make your post stand out in your readers’ News Feeds as they’re scanning through status updates. It grabs attention and is MUCH more likely to provoke a response from fans that a regular ol’ status. What You Should Do: Admittedly, we do not have the repertoire of images that Vin has at his disposal — and even if we did, our fans would think we were nuts (or really, really vain) if we posted pictures of ourselves every day. But with smart phones making it so easy to take and upload photos, you can find plenty of images worthy of sharing with fans. What you can’t take, you can find online. Use Google image search to locate just the right illustration for your status. You don’t *have* to do this for every post, but the more you can do, the better! You’ve got to share the love! 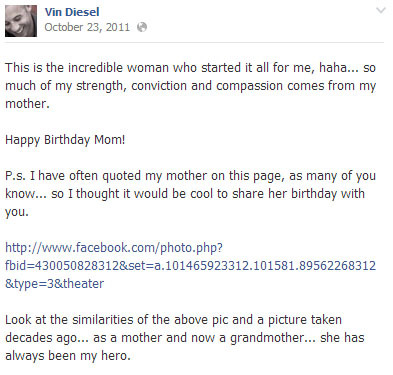 What Vin Does: Even Mr. Diesel, the ultimate tough dude, shows gratitude and graciousness every now and again. What You Should Do: Make sure you stop every once in a while (at least twice a month) to thank the readers who spend their time and money on your books. You can also show your appreciation with giveaways or sneak peeks of upcoming books/news. A little appreciation goes along way toward retaining existing members of your fanbase (which is a critical detail often overlooked when you’re focused on growing your fanbase with new folks). Check those out for some extra credit reading and share your ideas for great Facebook fan pages in the comments! Want more on using Facebook effectively? Take our online, go-at-your-own-pace Facebook Facelift Weekend Workshop! Thanks for the post, it’s really helpful, not just for the tips, but also seeing how you break down the things that are working on Vin’s page and why. Great post, but just for the record. Vin is NOT the lesser attractive one. Haha I did’t know I would be sparking an international debate with that little comment. Paul Walker is a horrific actor, but I melt for those blue eyes every time. Still, I see the appeal with Vin, so I respect the differing view point! Love this! Gotta start being more real on my FB author site. Yes! Getting past that mindset of over-thinking and over-planning your social media can be difficult, but life will be SO much easier when you can just relax and be yourself! And you’ll have a better response from fans, too. I will concede to equal levels of attractiveness for different reasons — it’s kind of like the Kitchen Cousins on HGTV. I’ve spent a lot of time trying to determine which one is hotter, but really they’re just two completely different kinds of hotness.